I've said it before, and I'll say it again. I love Times Square. I love the way it's grown and changed over the years, and bright lights have been its only constant. 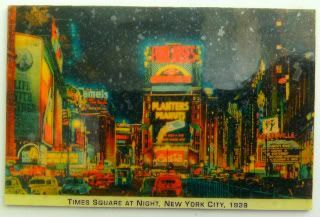 It's why I love seeing these images of old-time NY - either in books or on magnets, like this one from my magnet guy in Union Square. It's definitely a far cry from where I grew up, where the most lights we have are downtown, when the Christmas star goes up. Also, I use the term "downtown" loosely, given that we have maybe four square blocks of a downtown. Still, there's something to be said for living in the sticks. At night, you can look up and sometimes, your only light source are the moon and stars. Raccoons come up on your backporch to say hello! In broad daylight! Bunny rabbits hippity-hop to get out of the car's way. Every single time you come home! That's not even counting the deer that live in the woods in front of the house. Hummingbirds flock to your backyard. And, aside from the wildlife, you get to speed like a freakin' demon on the backroads. And, if you're me, on the way to the highway, you pass what's totally a biker gang hang-out, complete with the Rebel flag and American flag, next to an auto collision shop. My sister brought this wooden magnet back for me from her trip to her hub's family reunion down in Florida. 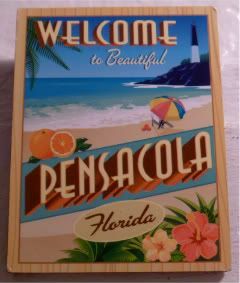 I haven't a clue if I've been to Pensacola before, but I really love the supercute design! Using it for today's magnet, because after last night's Emmys, I decided to do a midsummer dance card check-up. The list way below confirms that I still watch almost 40 hours of scripted television in any given week of the year. For real, my docket is seriously overfull. And that doesn't count any premium cable shows I no longer get, or the soaps I no longer watch, any of the Brit reality shows I get sucked into, and none of the Disney shows that I watch. How is it, that I don't watch a good 75% of the shows that won Emmys last night? Weird. 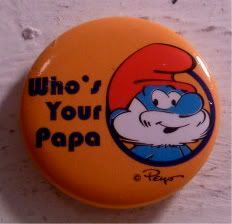 So what's the tenuous connection back to this magnet? The newest favorite show on my docket below, The Glades, on A&E. Little known, especially with a modest ad NYC transit ad budget (that pulled me in), and nicely done website. * It's really undersung, methinks. The lead is superdupercute Aussie Matt Passmore, with an odd accent that's probably supposed to be Midwestern, playing a rough-around-the-edges detective with an attitude who left Chicago and moves down to Florida. He reminds me of like a modern-day Humphrey Bogart, running around in jeans and T-shirts down in the Everglades. As per usual, I could care less about the procedural/case of the week - I mean, really, how many murders can they have in one county? I'm really all about the will-they, won't-they romance between the guy and my favorite sister from Related, Kiele Sanchez. Plus, it doesn't hurt that Clayne Crawford's got a little recurring role as well. (He's been my "Country Pacey" since his two Roswell episodes, where he totally was Maria's Dawson, but had an attitude like Pacey and an accent to match - hence the nickname, didjagetthat?). Yep. Trust me to watch a whole show based on a hot guy with a favorite heroine and a bit of my Pacey mixed in. What? It's what I do! And, in keeping with such, now I have to find either bootleg episodes of Related, Roswell, or throw on some Dawson's Creek, or, if I really want to add something to my docket...maybe I'll find some of Passmore's episodes of McLeod's Daughters. Oiy. Huh. I forgot to add in Life Unexpected, which pushes The CW into my most-watched network. Really? And yet, not surprised. Though I'm sure I'll make it down for the latest Norman Rockwell: Telling Stories exhibit in DC, my sister picked up a couple of magnets for me, just in case. This piece appeared on the October 31, 1933, issue of The Saturday Evening Post, and is of a woman sitting at her vanity, wearing the latest in fashion - a copy of a dress that Joan Crawford wore in the movie Letty Lynton. I love this, because you wonder, where's she headed? What's the occasion? Is it somewhere glamorous? Dinner? Or, is she just dressing for dinner? And don't you just love the little girl in braids and her little puppy watching her mom primp. So cute! ...so I'm gonna stop typing up this magnetblogpost to watch that big show. Though, I'm not gonna lie, there's a really big part of me that's waiting for a shot of (OMG, what's he doing, OMG, what's he doing here) David Tennant, plus George Clooney and maybe Jon Hamm and good gravy. It's a room full of my cuteboys! So, when I packed up my office a month ago, I rediscovered a whole boxed Marvel superheroes magnet set, that I bought in the Cincinnati airport a couple of years ago. The box set had the whole stable of Marvel folks, including the Fantastic Four, created by Stan Lee and Jack Kirby back in 1961. 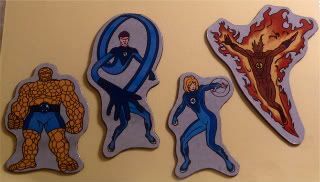 If you read the wiki I just linked to above, you'll learn more than you ever wanted to know about the Fantastic Four characters, including the special "Marvel method" of creating comics - which I'm sure all the people who were going to the comics panels of SDCC know about, but I didn't. I do love that Stan Lee called them "heroes with hang-ups" because in the end, most superheroes do have their hang-ups, foibles and neuroses. I won't lie, I've never picked up a single FF comic before, though I did go see the two movies. What? They were somewhat entertaining! Really, I'm just using these four for today, because it's STWsis' birthday, and I was supposed to be in Washington, DC, today and round out the foursome, but I agreed to stay at home and chauffeur the parents around. It's what I do. Now. We just have to figure out who of the Fantastic Four my two sisters, BIL and me are. I call dibs on the Thing. I've magnetblogged on our national papers several times by now, but I stumbled on this magnet that I got from either the National Constitution Center or the National Archives, and realized it was a good choice for today. My sisters and I used to be huge into jigsaw puzzles. Like a puzzle done every Christmas - the harder the better, the more historical the better. Some very cool puzzles out there, given that jigsaw puzzles were created in 1760 London by a mapmaker to use as an educational tool. Last week, I got sucked into my dad's doctor's waiting room jigsaw puzzle. It was a giant collage of about nine lighthouse images...and it took about four trips to that waiting room to get through the majority of it. By then, of course, I ended up having to leave the hardest bits behind. Basically, nine different sections of sky. Just sky. In about a dozen shades of blue. Oops! So, good luck with that eye doctor patients! So since that puzzle, I've been mentally doing puzzles in my head. It's ridiculous. I was in a Barnes & Noble ready to buy a puzzle, and I had to force myself to stop. I would look at various places along the I-95/85 corridor and think, hey, that'd be a great puzzle. I mean shoot. You can't tell me this Declaration wouldn't be a good puzzle to do, too! When we got home, I was milling around my room, when what did I spy? A jigsaw puzzle! Woot! I mean, a hard one, and dudes, it hadn't even been opened yet! I'll confess, that's what I've been doing in between the job search, eating my parents out of house and home, and running around visiting museums - a giant 24x36, 1000-piece jigsaw puzzle. That mapmaker from long ago would be so proud, though. It's all about the history of America (through 1997), and it's this huge collage of historic faces and places and factoids, surrounded by several small history museums around the U.S. 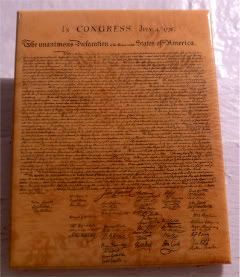 It also includes a giant section of the Declaration surrounded by the Founding Fathers. I love it! So much fun! You'd be surprised by how much history you can learn, how much you already know, and whose faces you recognize...and whose faces they opted to include in the puzzle. Also? I've found out, jigsaw puzzles are way easier to do when you're by yourself! Labels: collecting magnets, Declaration of Independence, family, history, magnet collecting, magnet collection, magnets, puzzles, U.S.
Yep, my second Maymont magnet. I've magnetblogged about that house before, so I'm using this one for today's visit to yet another obscure historical house. This time it was Robert Treat Paine's Stonehurst, in Waltham, Massachusetts, designed by Henry Hobson Richardson, with a little landscaping help from his friend, Frederick Law Olmstead. Some consider Richardson to be one of the greatest American architects - born in Louisiana, most of his work is scattered in New England, and the Midwest, from Trinity Church in Boston to the original Marshall Field store in Chicago, to having a hand in the NY State Capitol. 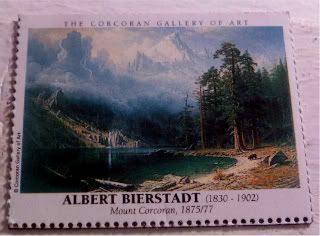 And of course, everyone knows Olmstead for his work in Central Park and Chapel Hill and myriad other places. Stonehurst was pretty bare, but man, was it gorgeous! Wood paneling, stone facade, giant hall, several parlors, fantastic. And of course, we were the only ones inside, and while we only did the self-guided tour, we ended up bombarding the poor lady with question after question after question. Eh. It's what we do. It's who we are. Oh. And we knocked on some wood, too. Sitting here at home at 1:45am while my parents are sleeping away what's left of the night. Mind you, I'm up magnetblogging because if I close my eyes, I'll see red brake lights in front of me. Like I saw from Teaneck to Fort Lee, which according to Google Maps is like 3-4 miles. It took us 3 hours to get to the GWB from Teaneck. All because someone made the decision to have only two cash-handlers on duty tonight (we had an EasyPass), which then backed up all the traffic for miles. Oiy. My mother loves looking at vanity license plates and trying to figure out what they say. But not only that, she likes to yell them out randomly as we're driving, almost like a Tourette-sy thing. 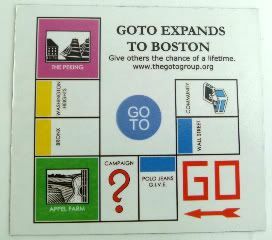 Like, all of a sudden, you'll hear, GOHOMES! Or, SQUEAL! and then the faint twitter of laughter to herself. There was a van from some forgotten state with the plate: OND 9OU. Mom spent a good five minutes trying to figure that plate, down near Elizabeth, NJ, somewhere around 8:45-9pm. Somewhere around 10-11pm in Leonia, NJ, out of the blue from the passenger seat, I hear Oh, Deny, Oh, you! And some satisfied chuckling. Seriously. My sister wasn't kidding. We make up our own fun. Oh! But, yay for my parents! 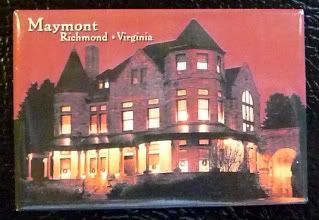 They let me exit 95 at Richmond to buy a Richmond magnet! Whoot! We all have that one teacher that we remember growing up - the one who took extraspecial care for us, the one who mentored us and made getting through the schoolyear easy. For me, that was Mrs. Honbarrier, my fourth-grade teacher, who, besides having a Fireball factory in her basement and always having her ventriloquist's dummy take class pictures for our yearbooks, was just the best teacher ever - and there are tons of people who went through our public school system who will back me up on that. She gave me the gift of reading by noticing my head was always stuck in a book. She began to let me borrow from her personal library, even though we had a perfectly good one on the other side of campus. But it wasn't just fiction. That bookshelf was where I learned about the assassination of Abraham Lincoln and the cow on the White House lawn. And, oddly enough, it's where I learned about Service Dogs, and how they train the puppies from birth to be guide dogs for the blind. No, I haven't a clue why she had that book there, but I remember being fascinated by the fact that the dogs can sense danger, and be trained to protect their humans from the outside world. That's why Mrs. Honbarrier came to mind yesterday on the train, and why I knew I had to use the London Transit magnet, because an old lady carrying a supercute cocker spaniel walked by me. The spaniel was wearing a little yellow jacket that clearly marked him as a service dog, and I instantly remembered that service dogs book from fourth grade. Mind you, it was really because I was trying to remember if they ever mentioned any other breed besides German Shepherds being guide dogs, but still, I'd bet that Mrs. H would never have guessed that almost three decades later I'd still recall the books she loaned me. So funny, last week, on our impromptu roadtrip to DC, my auntie-in-law revealed that she's a magnet collector. 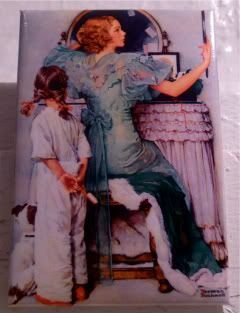 Wherever she goes, she buys a magnet or two, because they're inexpensive. And they're everywhere. She mentioned that she might have to get a new refrigerator, just to have space for her magnets. So, I showed her my pictures, so that she could figure out how to set up additional space of her own. She even has the same magnet-bringer-backer friends that I do - people have started to bring her back magnets from their travels...and so she's had to separate those from the ones that she's bought. Basically, the places she hasn't been on one side, versus the places she has on the other side. It's quite a system, and I can't imagine doing that for mine. If I had to guess, I think it's about a 70/30 split for magnets that came from other folks. I mean, here's a case in point, with today's cool magnet. I haven't been to Madrid...but, as the Google Translator magnet says, "My friends went to Madrid, and all they brought back for me was this foul magnet!" Remember how I love discovering Monets that I've never seen before? With every museum I visit they're getting increasingly hard to come by. But my visit to the National Gallery in DC a couple of weeks ago yielded a couple of them. Not surprising, given that they have about 2 dozen Monets in their collection. 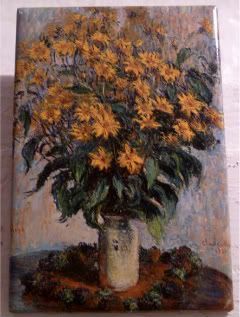 This one, is a rare still life from Monet, called Jerusalem Artichoke Flowers, done in 1880. It's gorgeous up close, with the tiny details and beautiful yellow color palette. The other one I discovered was Banks of the Seine, Vetheuil. That one quickly jumped to my top three, just because it's superpretty with a green, yellow and blue palette. There was something hopeful about the piece, versus my number one fave Rocks at Pourville, Low Tide. Right now at the National Gallery, there's an ongoing exhibition of the Chester Dale collection, called From Impressionism to Modernism, and it's just fantastic to explore. The Dales were a wealthy couple in the first half of the 20th century who basically created a large collection of art - he paid for them and his wife Maud picked them out. So, when the National Gallery started up, they turned to the Dales for help. In the end, the Dales bequeathed about 300 paintings to the National Gallery. When you're wandering through the exhibit, you just think, jeepers, these people owned all these pieces - how much wall space did they have? One thing cracked me up was that both Chester and Maud had their portraits painted by famous artists - much like the wealthy folks and royalty did in Europe. There are two portraits of Chester - one done by Diego Rivera and one by Salvador Dali, and then Maud's two portraits was done by George Bellows and Fernand Léger. I dunno why it made me laugh, probably cuz mentally, I was trying to figure out how Monet or Hopper would paint me. Jeez, these peeps had soooo much disposable income to patronize the arts, it's crazy! I suppose if I had that much disposable income, I'd buy a painting or two. Of course, I'm fairly sure if I collected real art, I wouldn't be worried about value or context within my collection, I'd totally just end up buying the pretty ones I liked. And probably the ones in a blue color palette. Heh. Impromptu DC roadtrip turned into today's impromptu New York City Adventures day, wherein I shepherded my teen cousins around town. Crazy walking - of course...and combined with some crazy eating. The day included a picnic on the High Line, a walk around Chelsea Piers, a visit to the Forbes Galleries for their soldiers and toy boat collection, cupcakes at Baked by Melissa, browsing the Strand, storytime at the Scholastic store, stumbling into the Van Leeuwen ice cream truck, browsing Pylones and the MOMA Design store, tons of rice pudding at Rice to Riches, a glamhike through SoHo, and pizza uptown. Seriously exhausted, but so much fun! It's truly why I love this town...when we were deciding what to do this morning, we couldn't think of anything. So, we just got on the subway and let the day take us where it may. 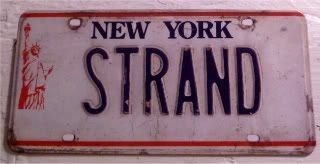 Of course, I think I need a pair of handcuffs for The Strand. I can't help but pick up books and books there! Argh. But, dudes. 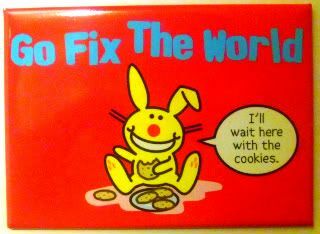 How cute is this magnet! I went on an impromptu DC family roadtrip a couple of days ago - 5 hours down on Thursday morning, 5 hours up on Friday night. So much fun! Friday's itinerary included the "Design for the other 90%" sustainable development and the Da Vinci Inventions exhibit at the NatGeo Museum, the National Archives, the East and West Wings of the National Gallery - all before 1:45. And then American History museum and the Basilica by the time we left at 6. I've never done NatGeo, but I plan on going back for any other exhibitions they have. The Da Vinci was totally cool, but man, all I could think of was how many of the inventions we saw Da Vinci use in the movie Ever After. (Shut it - you know it was a good movie.) It's scary though, cuz when you see his work, you have to wonder how unique his mind was to invent precursors to half of the machines we use now. Learned a couple of new things at the Beatnik photo exhibition at the Gallery. They exhibited Allen Ginsberg's personal photos, complete with his personally handwritten captions to tell us the backstories. Amazing. I didn't know that Ginsberg and Burroughs (the grandson of the inventor of the adding machine on this magnet) were together, and lifelong friends. I didn't know they were pals with Jack Kerouac. Going through those halls, I really had to resist the urge to throw on a black beret, light up a cigarette, and snap my fingers. 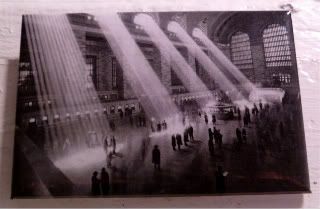 I bought this magnet at the Archives - leftovers from a previous Patent Office exhibit. 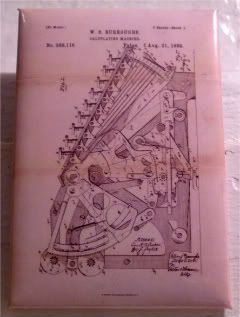 But, how cool is this drawing for the original adding machine? The best part of the Archives though, wasn't the Declaration, or the Constitution, or the Bill of Rights, or the Louisiana Purchase or Emancipation Proclamation - or shoot, even the Magnet Carta of 1297 that was shoved in the corner (even though it's older than our national documents by a good 500 years). Nope. It was this little boy, about 5 or 6, and his very loud outdoor voice reverberating through the echo-y Archives Rotunda, telling the security guard - I'm HERE to see the DECLARATION of INDEPENDENCE! And then in a much softer voice, he told the guard, It's an honor to be here! And promptly stuck his face in his mother's skirt. Another one of my Bored Inc. magnets I picked up from Comic-Con. 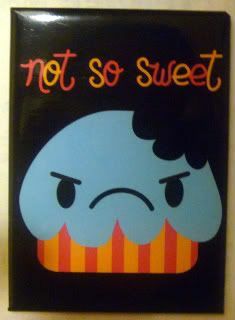 It's kinda funny - I was gonna use this magnet for my first day back into work from Comic-Con, but since it turned out to be my last day at work, I decided I didn't want such a sourpuss magnet for that day. So, I'll use it today, because there was a part of me that thought that La-la-land was all cupcakes, sunshine and puppies. But lists like this TV Guide list of actor per-episode salaries lead me to believe that life mightn't be so sweet for all of them. But, since the information's now public (not that I know where it came from) and even though I find it a little uncouth to discuss such matters, and ridic that we're given all this information on anyone's salaries, and it's absolutely none of our business, I do find this entertainment business quite intriguing. Like Mark Harmon (325k) making double Michael Weatherley (125k) - that difference kinda makes sense, because of seniority, and probably producer credits, etc. But how crazy is it that iCarly's Miranda Cosgrove (180k) is making so much more on a Nick show than Wizards' Selena Gomez (30k) on a Disney show? And how is Ian Somerhalder is at 40k on the CW's Vampire Diaries, the same as Shailene Woodley on that ABCFamily Brendavision show? And Chuck's Zachary Levi is at 60k at NBC, while old Chuck buddy Matt Bomer's at $100k on USA's White Collar, and both NBC/USA are in the same NBC Uni family. See? While it's none of our business, it's still utterly fascinating. It's weird, because they didn't release all cast information - so while Lauren Graham's at 150k, it'd be interesting to see Krause's or Coach's. Angie Harmon's at 75k as Rizzoli, but what's Gretchen Sasha Alexander making as Isles, I wonder. I know, I apologize, it's totally none of my business. Still, I'm not really judgey about how much they make - per episode - they're actors, they work hard, they live a career based on their skills and their looks. I've never thought it an easy occupation. It can't be. Plus, it's not just the shows, it's the PAs, the marketing/PR they have to do, etc. Oh, I could go on and on, comparing networks to networks, hour-longs to sitcoms, gender, seniority, BBC actors being employees of the state vs. Hollywood, etc. But, it's just a cupcake magnet. My guess is that this list must cause a ton of people in the entertainment world some severe agita. I can't even imagine the myriad calls that will be made in the coming weeks over salary disparities. Crazy. But, I can tell you, if this were Corporate America, and each company published this kind of list, with such readily apparent disparities? Man, there'd be total anarchy! One of the things from FDR's era that I wish we could put in place again nowadays are WPA Federal Arts Projects. 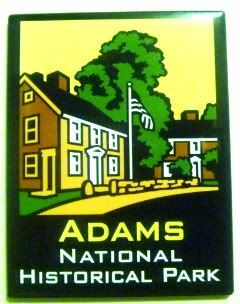 The FAP was basically the visual arm of the New Deal - where they employed hundreds of artists and artisans to beautify different public buildings and institutions with murals and paintings and posters. I just love stumbling onto this art around the country. Whether it's the artwork at Rockefeller Center, or in the New York Public Library, or in Balboa Park, San Diego, it's truly a snapshot of U.S. History. This Woman of Tehuantepec fountain was done by Donal Hord, who was commissioned to do a couple of pieces around San Diego. She's meant to symbolize the beauty, grace and independence of the women of the Isthmus of Tehuantepec, and she sits just inside the House of Hospitality pavilion of Balboa Park. She's a bit of an unexpected treasure. You're walking down the outside of the pavilion, and you turn into the courtyard, and there she sits quietly, save for the tourists taking pictures all around. It's like a little slice of peace in that courtyard - I think my favorite part of Balboa, now that I think about it. ...me! You'll note that the last few days of my posts have actually been pretty upbeat and positive, and in general, more joyful than they have been in the last year or so. And, that fact alone gives me more "happiness, delight, elation, pleasure, glee and merriment," than anything else right now. It's a good thing! It's a joy thing. And speaking of a joy thing. Ya'll. I'm at 900 magnets. A hundred shy of a thousand. Sure, it doesn't put me in league with that magnet lady of Vegas (she stopped counting at 40,000 magnets, back in 2008), but it's kinda getting scary now. Up until just over a week ago, I had my magnets here at home, plus up on two locker walls in my cube at work. Since I had to decamp from that cube, all of those "overflow" magnets are now sitting in a pretty big and heavy Verizon bag inside a giant Green Hornet bag (thank you, again, Sony Pictures Entertainment, for the timely giant tote bag from SDCC). One of my projects over the next few weeks of free time is to figure out what to do with my magnets, because no amount of reconfiguring the dozen metallic surfaces of my apartment will give me enough room for the magnets I just brought home. Annnnd, I suppose it doesn't help that whenever I see a good scrapbook sticker - such as this one I bought in Staten Island last week - I like to make a good magnet out of it. Oiy. And, it's not even like I have a car to put magnets on, either! Double oiy. I'm unpacking that giant Green Hornet bag, and there's not just one, but two bags of magnets! Sheesh. I wonder if the walls of a storage place are metallic. One of the things I learned, hanging out with my stay-at-home mom friend in Del Mar, CA, was that a healthy work/life balance allows for evening time fun. Her hub came home at 5:30, and we all headed out to the park by the beach, just down the way from this powerhouse. The Powerhouse was built back in the 1920s to house the utilities for the historic Stratford Inn a few blocks away. It's had a few lives since, and has since been rehabbed into a community center. So, the kids had some playtime and dinner at the playground and we got to soak up the fresh air and sea breezes - a fun couple of hours. It was a completely foreign concept to me, this downtime by the beach, after the office, getting to recharge after a day at work. It was kinda nice. But, really, my friend just figured it was the only way to get me to the beach...without actually getting me to the beach. Heh. So yesterday, a friend and I went to visit the Philip Johnson Glass House out in New Canaan, CT. 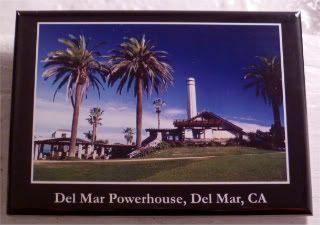 Sadly, their cute little gift shop at the Visitors Center didn't have any Glass House magnets (Note to Visitors Center, magnets are the #1 purchased souvenir, worldwide - I'm just sayin'.). 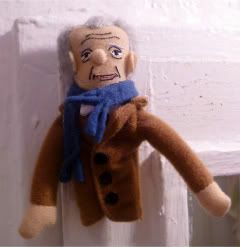 But, they did have a good collection of the finger puppets that I love so much (but refuse to collect). As it turns out, Frank Lloyd Wright and Philip Johnson weren't the bestest of friends, though they had a healthy respect for each other's work. So, apparently, FLW was at the Glass House for dinner one night, and throughout the night, he and Johnson ended up arguing over the placement of this papier mache sculpture. Because it was so light, FLW would move it to where he thought it should be. And then shortly after, PJ would go and move it back. After a couple of times, the situation came to a head, and Johnson grudgingly agreed that FLW's placement was correct. For some reason, thinking of these two men arguing over this sculpture makes me giggle. A lot. Anyway, the 2-hour tour was fantabulous - well worth the several months' wait for our tickets. It definitely ranks in my top 10 tours of all time. Not surprisingly, my favorite part of the tour was the Painting Gallery, where several of the PJ/David Whitney collection are left. I would talk more about this tour...except that I seriously spent a couple of hours captioning the hundred photos I took. So, you can take a look at the entire FB album here. Enjoy! Then hurry up and book a tour next year, so we can compare notes! *PJ quote, about FLW in the Ken Burns FLW film: "I hated him of course. But that's only normal when a man is so great - it's a combination of hatred; it's a combination of envy, and contempt, and misunderstanding - all of which gets mixed up with his genius." 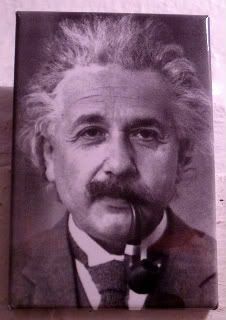 I picked this Albert Einstein magnet from Pomegranate for today, because I think he would have had a heyday with Inception. He'd probably talk for hours about the layered realities and dreams, the inherent quantum time and physics of each layer, and of course, the relativity of it all. But, here's the thing. He'd have to go discuss it with someone else. I hate movies that make me think too much. There. I said it. There's a reason I go to movies, and that's to go into a darken theatre and forget about the world at large for a couple of hours. Yes, there's an argument to be made for a movie to challenge your thinking about what you know to be truth and reality. There's an argument to be made for a movie to expand your horizons, to teach you something. There's even an argument for a movie to scare the living daylights out of you. But, you know what? I hate being mindf*cked. Hate it. So any movie that exists solely to make me think about it days later makes me crazy. On top of that, I also hate nonlinear storytelling, which is why I also didn't get through Christopher Nolan's Memento. And, yes, I know that's quite an unpopular, if pedestrian, opinion. I don't care. Now. On the flip side? Inception was gorgeous. The direction was phenomenal, the cinematography was beautiful, the effects were amazing, the multiple locations were fabulous, the architecture was awesome, the score was terrific, and the pretty people were, well, pretty. So, I guess that leaves me on the fence about Inception. I hated the mindf*ck, but loved the production as a whole. And, I dunno what dreams may come tonight, but the movie kinda made me realize that the vivid, violent and unhappy dreams I was having earlier this summer have all but gone away in this last week of freedom. It's kinda nice to have my good sleeps back. Now, I just gotta find me a totem. Whether it's me missing stuff in Dublin, or my mom not feeling like seeing that David thing, it seems that the "visit somewhere and miss a big thing" thing is hereditary. In this case, it's STWsister being in Nepal for eight months, and not visiting their big museum. Sigh. It was only a dollar! I lived in Nepal for eight months. Was I trekking the whole time? No (though I’m sure my parents thought I was). I was there to do research for my master’s thesis. But really… I was just living in Nepal. And it was fun. I lived down the road from Patan Durbar Square. 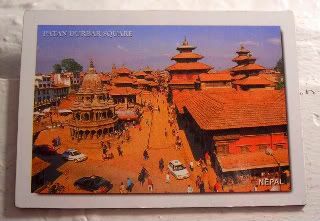 There are three Durbar Squares in the Kathmandu area – Kathmandu, Bhaktapur and Patan. These were the three main cities in the old days. Each of the squares are surrounded by old temples and filled with tons of people – Nepalis and tourists. And because they are big tourist attractions, you have to pay to enter the square… if you’re a tourist. When I was in Nepal, I tried learning the language if only to talk to taxi drivers and shopkeepers. I found that being Asian (read: brown), I was often confused for being Nepali. It was nice. Throw on a kurta (a longish tunic) over pants and all of a sudden I’m Nepali. Since I lived close to Patan Durbar Square, I liked to visit it a lot – just to sit and people watch and because my favorite supplier of bangles (I developed an addiction to the shiny bracelets - [note: this is true, we all benefited from this addiction, as she unearthed box upon box of bangles from her suitcases - joy]) had her shop in the square. Getting to the square was always an adventure because I managed to get lost ALL the time no matter how many times I went. The streets are just THAT small and twisty. Once I got to the square, however, I would just walk past the tourist ticket booths and ignore the ticket takers. Sometimes they would stop me and ask for my ticket and I would look at them, laugh and say “Nepali ho” (I’m Nepali). And they’d believe me! HA! I don’t feel bad about it either because TONS of tourists come through and do pay the entrance fee (at one of the other Durbar Squares, it’s almost $10!). I really love Patan Durbar Square, though. Like all places in Nepal, this square is constantly crawling with young people all looking for a quiet spot. You’d think they’d find less public places to go hold hands, but they don’t. Along one side of it is the Patan Museum (which apparently has an intriguing collection). Now, I never really went to look in the museum, but I did go to a benefit concert there in which Kutumba did an awesome show and won me over as a fan. Patan Durbar Square is where things happen. I’d say it is the best of the three Durbar Squares. Kathmandu Durbar Square is overcrowded, though the night market is cool. Too many demonstrations happen around there. And sometimes the Kumari Devi (living goddess) shows up there and causes massive crowds and confusion. The Bhaktapur Durbar Square is more geared for tourists, so it’s in better shape. It’s quieter and cleaner, but doesn’t seem as alive as the other two. Patan Durbar Square is more real to me, I guess, because that’s where my Nepal was. I miss that Nepal… all the people, all the food...and all the bangles. Vincent and the Doctor is one of my favorite episodes of Doctor Who - ever, where Eleven and Amy go back to visit Van Gogh. Loved that. And one of my favorites scenes is here, when they wake Vincent up out of one of his paintings, and he peers out his window at Amy sitting among the sunflowers, and Amy learns that he doesn't really have a thing for sunflowers. 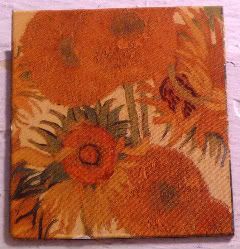 Several canvases seem to say the opposite, for Van Gogh painted at least a dozen still lifes of sunflowers in every stage. From gorgeous full blooms to dying blossoms strewn on the ground, it was clear he had some sort of affinity for them. The backstory being that people aren't really that sure if he loved the flowers themselves, or if he just painted them to please his buddy Paul Gauguin. Or, if he painted them because at the time, yellow paint was a new set of hues that they came out with and he loved experimenting with those shades and the joyfulness of the color. At any rate, he considered the sunflowers his flower to paint. And now, of course, now I feel the need to run over to the Met to check out their batch of sunflowers. 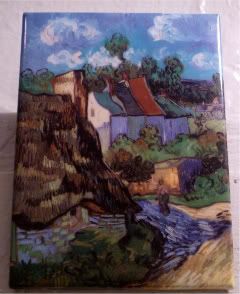 Van Gogh was one of our answers to one of the clues during last Saturday's Watson Adventures' Murder at the Met scavenger hunt. I've done the same hunt before, but with a different set of clues. Hard! I dunno if you guys have ever done one, but I love them. For two hours, you think of nothing but getting to the next clue by solving the one you're working on, and getting lost in the details and figuring out red herrings, and not really seeing the art in front of you. Mind you, I'm not always so good with figuring out those clues, but I'm really good at getting you where you need to go when it comes to getting around the Met. Well, unless you're looking for cups from the first millennia in two different rooms. And you lose 20 minutes because of it. Oops. For me, though, the best part about that scavenger hunt was that it brought me to rooms I'd never been to before - I can't wait to get back there to explore them...and those sunflowers. Poor Taft. Hovering somewhere around 300 pounds, William Howard Taft was indeed our heaviest and largest president. Remember that Cow on the White House Lawn book I read a long time ago? The Taft story I remember from that is that he's the only president who got stuck in his bathtub. But, I think that's just an urban legend. He supposedly ordered the largest bathtub ever for the White House, though. Another Taft legend was that he unwittingly invented the seventh-inning stretch. He went to a baseball game, and having to squeeze into the wooden seats, he couldn't take it, and by the seventh inning, he got up to take a stroll. Others thought he was leaving, so they got up as well. And thus was born the YMCA yardrakers seventh-inning stretch. I'm just using Taft for today, because he visited New York to attend the opening of the first New York Public Library main branch in 1911. 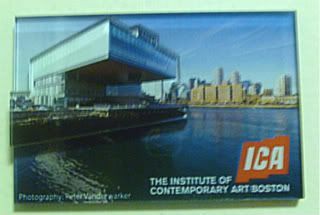 I took the tour this afternoon, and it's such a wonderful building. I don't know why we don't build more things out of marble these days, but Carrère and Hastings' Beaux-Arts architectural style of the main branch is just breathtaking. We went walking around Astor Hall, where the soft-spoken guide explained that the marble was from Vermont. And then into the periodicals room, where the wood was French something or other. And then the new modern steel and glass addition nestled in the heart of the library. And the story of the written word in four WPA-painted panels in the McGraw Rotunda. And the tw0-block long reading room on the top floor. Oh! And a Guttenberg Bible! Seriously. A really great tour, even if I couldn't hear the guide. I will admit, though, that it was fascinating to roam one of the back halls and see some of the 88 miles of stacks they had hidden from general view...mostly because about 20 years ago, my sister and I came to visit the library, and we were so excited to visit the library, and we walked and walked and walked, and lord help us, we couldn't find a single book anywhere. We seriously didn't understand why the main branch didn't have any books! Actually, there's something scary and fun about the fact that they're gonna turn the main branch of the library into an actual lending library, and move the current stacks into a new facility under Bryant Park! Jeepers, I can't wait for that tour! My first instinct, now that I have some time to breathe and some free time on my hands, was that I wanted to run down to the Gulf and help in the clean-up efforts. But, I just read somewhere that they really don't want people to travel down there to help out. Which seems odd, but I guess understandable. So, in the next couple of days, I'll be trying to find some way to be useful from NYC - some way that doesn't include calling people up asking them for money, anyway. I'm sure there have to be some sort of volunteer positions here in town, no? It's actually kinda funny, a friend of mine Tweeted that BP's looking for some help, with people calling it the worst job in the world. There's a part of me that believes it - I mean, no company's rep has gone from so loved to so reviled so fast. But, there's a part of me that thinks, man, anyone who could possibly bring BP's corporate reputation back to the land of the living will win PR Person of the Universe. Man, what a job. Good luck with that. And I'll be waiting over here with the cookies. 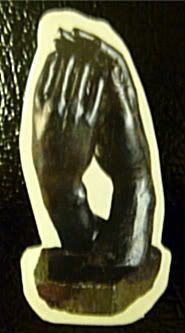 I debated on using this David magnet for joy magnetism, but then I realized you know what? It's considered one of the world's masterpieces. It's art. Deal with it. We had a bit of a tough time of it in Florence last year, our first day being the worst. day. ever. Everyone was fighting. No one wanted to be there. And on top of that, God gave us some torrential rainshowers to deal with. In the middle of the day, with little coverage and only a few umbrellas between us. Oh, my, it was just miserable. It was that day that I vowed to see what I could of Florence, because dadgumit, I was never coming back to town again. So, a couple of days later, when my mom said, tiredly and clearly at the end of her rope, I really don't want to go see "that David thing." But we all said, "Hold up. We're here. We're in the neighborhood. Hells yeah, we're going to see 'that David thing.'" And so we did. Can I tell ya'll? And there's really no way to say it without it sounding dirrty, but honestly, I had no idea how big David was. Everyone talks about Michelangelo and you've seen his work online and on tv and in books, and you sort of vaguely understand and accept that he's one of the greatest artists that the world has ever known. But, until you actually see his work, you just don't really get it. So when you go to the Galleria dell'Accademia, and you turn the corner and you see David for the very first time from afar, down the long hallway, your breath just catches. I mean, Michaelangelo sculpted this 16-foot (or 17, depending on who you believe) fine specimen of man from one piece of old, remaindered marble. One! Piece! It took him about three years, from 1501-1504. Dudes. That's more than FIVE hundred years ago! And yet, here David stands proudly in this magnificent gallery space, all by his lonesome, save for the dozens of onlookers (uplookers)? examining every inch of his almost perfect body atop his giant pedestal. I say almost perfect because supposedly, the piece was conceived to be an outdoor sculpture, hence the larger than scale hands and feet. Oh! And according to the Accademia site, if you look at David's face head on, his eyes are actually looking in two different directions. Honestly, once you see the guy up close, all the way to his veins in his hands, forearms and legs, you just appreciate those other imperfections, as utter perfection. So, yeah. If you get a chance to go to Florence, drop by and see that David thing. Mom didn't regret going in the end. As for me, the best part about the visit was the sheer fascination the piece held for my dad. He's always loved to see how things are made, and has so much respect for workmanship that goes into any craft - whether it's building megabridges or building a simple wood cabinet. Watching him appreciate and study David was a lovely thing to see. No kidding, in the couple of hours we spent there, we couldn't really tear him away from it. He must have walked around the statue a good dozen times, coming up with new details on every trip. We did, too, just to I Spy every detail. Right down to David's thing. What? I couldn't help myself. I know it's art, but I just read that some companies who offer replicas of the piece actually offer a fig leaf, free of charge, for those who want to censor themselves. I mean, what?